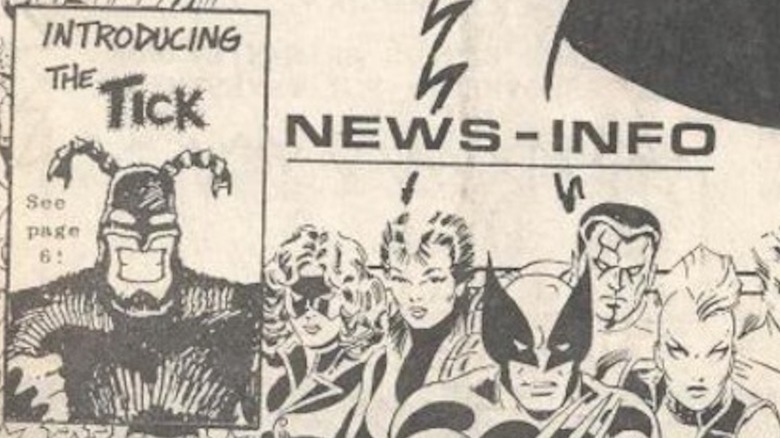 Regionally-published, black-and-white superhero comic books created to make fun of other superhero comic books generally don't spawn a character that lasts for more than 30 years. 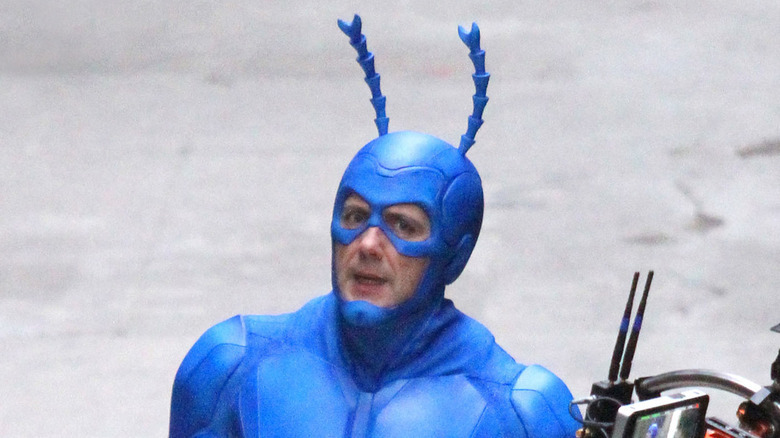 But that's what Massachusetts comic book artist and writer Ben Edlund did with his unique and hilarious creation, the Tick. The mighty, and mighty delusional, sworn protector of the City against the forces of evil has been the focus of a long-running comic book series, a cult classic Saturday morning cartoon, a cancelled-too-soon live-action sitcom starring Patrick Warburton, and another live-action version with Peter Serafinowicz streaming on Amazon. The creation, development, and longevity of the character (and his loyal if reluctant sidekick, Arthur) boasts a rich backstory full of stuff you didn't know about the big blue bug. Spoon! Tick creator Ben Edlund isn't one of those guys who loved comics since he was old enough to read—in fact, as he tells it, he didn't really get into them until he was 17. He didn't have a driver's license, so if he wanted to go anywhere or do anything, he was at the mercy of his friends with licenses, and that often meant going to New England Comics in Brockton, Massachusetts. Edlund eventually started drawing his own comic about a "pedantic sort of boy superhero," in which one of the supporting characters was a 300-pound, seven-foot-tall guy in a blue costume who called himself the Tick. He showed his drawings to the folks at NEC, who liked the look of the Tick so much that they hired him to do some drawings of the character for the store's newsletter. Edlund's work appeared in three editions in 1986. The drawings were such a hit that New England Comics offered Edlund a big opportunity: If he wrote a full-length comic, they'd publish it. Edlund agreed…but then took a whopping year and a half to finish that first issue. 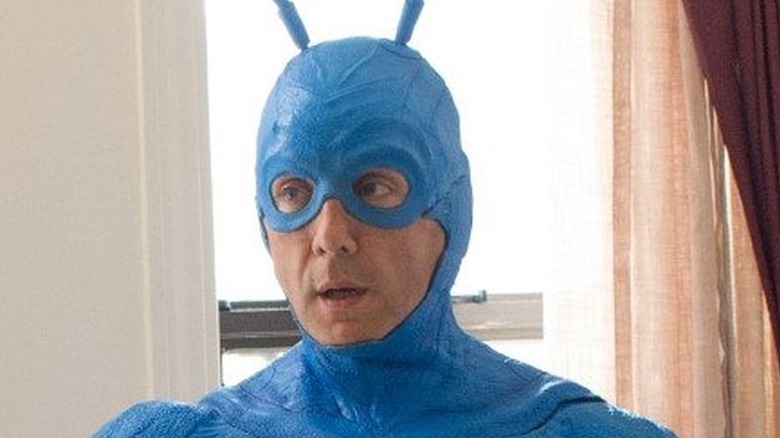 He had his reasons: At that point, the Tick was little more than a drawing, so Edlund had to develop the character, create a supporting cast, build a world up around them…and then draw and write and draw the whole thing himself while juggling his course load, studying film at the Massachusetts College of Art. The Tick #1 was finally published in early 1988. The black-and-white comic became a huge local it, and NEC wanted more. Edlund obliged…eventually. He produced a mere 12 issues of The Tick over the next five years. "They are very detail intensive, so there are a lot of connected storylines," he explained. "It was also densely written as far as comedic ideas are concerned, so each issue that came out provided a reasonably enjoyable experience for the reader." Edlund then walked away from making Tick comics for awhile, because by the time issue #12 was published in 1993, he'd signed a deal with Sunbow Entertainment to adapt the characters into a Saturday morning cartoon for Fox. It ran for three seasons, from 1994 to 1996. 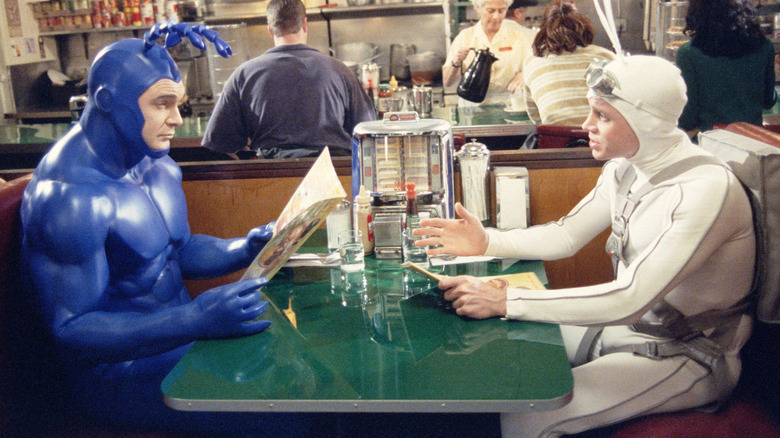 When the live-action version of The Tick premiered on the Fox network in 2001, it was filmed with certain legal restrictions. The Sony-produced series wasn't allowed to use anything in the Tickverse that originated on the animated series, whose rights at the time were controlled by other corporate entities. Anything from Edlund's original 12 issues were fair game, such as The Tick, Arthur, assorted villains, and the catchprase "Spoon!" Not available, because they were created for the cartoon: The Tick's super friends, American Maid and Die Fledermaus. In their place, the new show's writers created the very similar Captain Liberty and Batmanuel. The live-action version was critically acclaimed, and the creative team still loves it, too. The first episode was directed by Barry Sonnenfeld (Men in Black, The Addams Family), who called it "the best thing I've ever directed." Nestor Carbonelli, who portrayed Batmanuel, said it didn't get enough love and is a "very special" show to him. Unfortunately, it would seem Fox bungled the show right out of the gate, filming the pilot in 2000 with the intention to put it on the air during the 2000-2001 season, but delaying the premiere for a year. Then, according to Warburton, the series was shot "piecemeal." As many as six months would go by between filming episodes. And when it did shoot, the production was given a very tight timetable, resulting in cast and crew working 20-hour days to finish on time. After all that, The Tick was stuck with an impossible timeslot in the fall of 2001: Thursday nights at 8, opposite ratings juggernauts Survivor on CBS and Friends on NBC. Only nine episodes were produced and aired, and the series was summarily canceled. 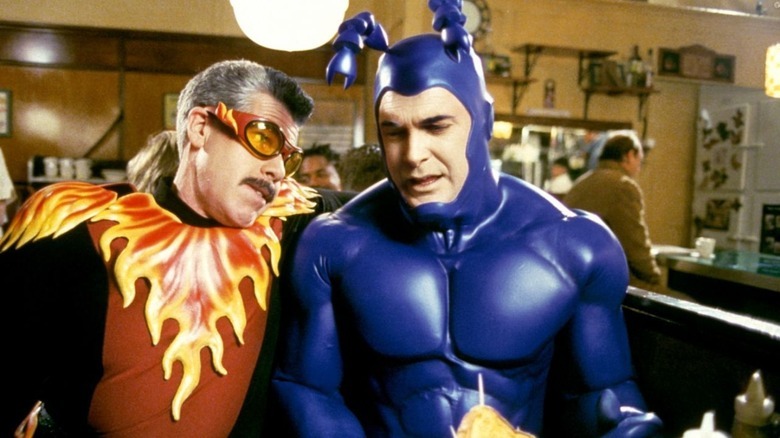 A number of things made The Tick complicated to shoot, including Patrick Warburton's Tick costume. 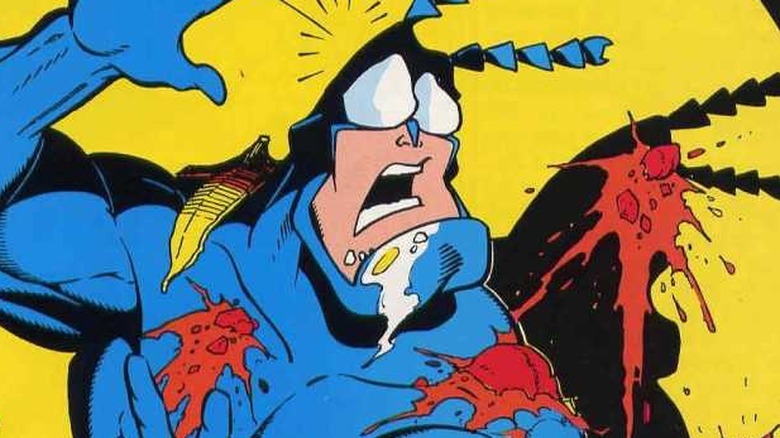 The initial design called for an eye-covering cowl like the character wore in the comics and on the animated series, but once Warburton was cast, the decision was made to not cover up the extremely expressive actor's face. 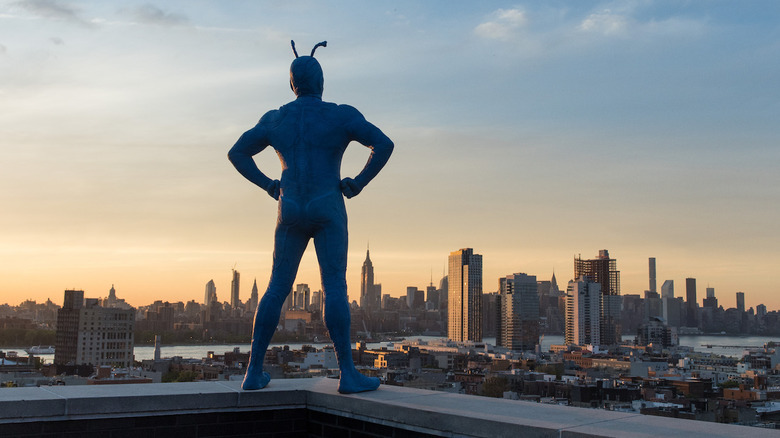 Created by Oscar-winning costume designer Colleen Atwood, the Tick's suit included moving antennae that were remote-controlled by animatronics and robotics expert Mark Setrakian. 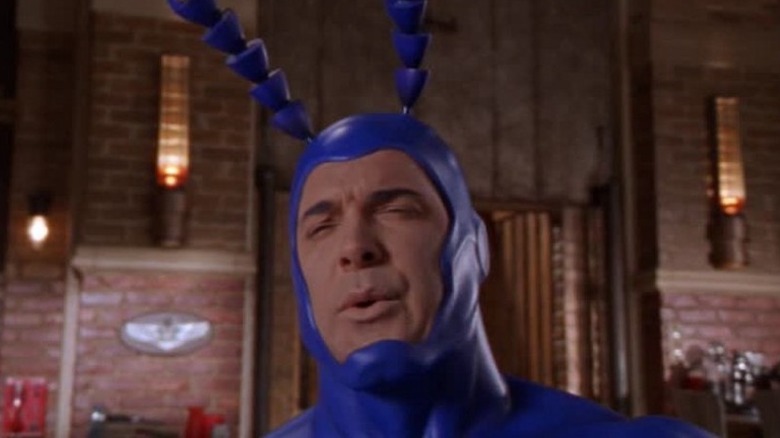 In late 2014, The Tick became the latest short-lived cult show to be revived by a streaming network when Amazon announced plans for a revival, complete with star Patrick Warburton. Months later, in May 2015, Warburton told E! News that he'd negotiated an out in his contract with his NBC sitcom Crowded, adding, "The Tick is a true love of mine." But in early 2016, news broke that British comedian Peter Serafinowicz would put on the blue suit. What happened to Warburton? "Amazon had different ideas," he claimed. "They wanted to build it entirely new from the ground up, and so I'm 100 percent in support of that. Supermans get replaced. Batmans get replaced. Even the Tick." While he's a producer on the Tick revival, Warburton is busy with another project on another streaming service, starring as Lemony Snicket in Netflix's A Series of Unfortunate Events—which just so happens to be helmed by his old Tick collaborator Barry Sonnenfeld. The influence of The Tick's satirization of action and superhero cliches can be felt across pop culture in shows like Adult Swim's The Venture Brothers. There are even a few direct connections between the Tickverse and the Ventures. Christopher McCulloch, a.k.a. Jackson Publick, has contributed to every previous iteration of The Tick—comic book, animated series, and the first live-action series. 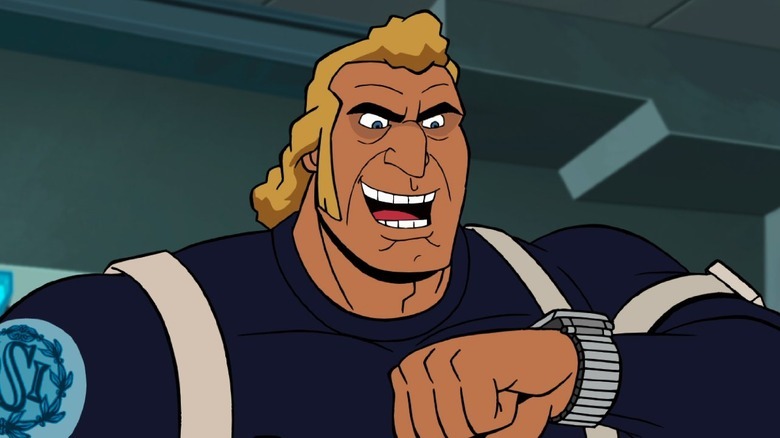 While on set for the latter, he got to know Tick star Patrick Warburton and a couple of years later, when he was putting together the voice cast for The Venture Brothers, he signed up Warburton to play hulking bodyguard and intelligence agent Brock Samson. McCulloch also brought in his old boss, Bed Edlund, to write a few episodes of the series. The first two TV incarnations of The Tick were abruptly canceled, both with lots of stories left to tell. With the Amazon revival, creator Ben Edlund wants to do it differently: he's carefully plotted out exactly what he wants to happen over the course of the show, ambitiously building a world, fully developing characters, and telling a complete story that has a beginning, a middle, and an end. Specifically, Edlund wants The Tick to run for five seasons of 10 episodes each. "My goal is to make 50 of these episodes that make up a continuous story that can be binge-watched," he explained. "That at the end of it, you go, 'Oh, I just watched a five book series called The Tick. It's told me about the whole world of it, about why it started and why it ended and why we began the story.' Not just a free jazz improvisation that goes for as many seasons that you've got funding."